It happens to everyone: you, a friend, or maybe a family member suffers a cut or laceration. It’s bleeding, it’s pretty bad, but it’s not that bad. What should you do? The emergency room can be expensive and the family doctor might not be open. Should you wait? Never! If you need stitches, you can’t afford to wait. The most important thing to do to prevent scarring and infection is to see a doctor as soon as you can and have the wound stitched. While most cuts can wait up to 24 hours for treatment, a wound that requires professional care or stitching should be looked at by a doctor within eight hours to prevent permanent damage or dangerous infections. Here at FastMed we know that these “middle-ground” decisions can be the most difficult to make. So we’re here to help! 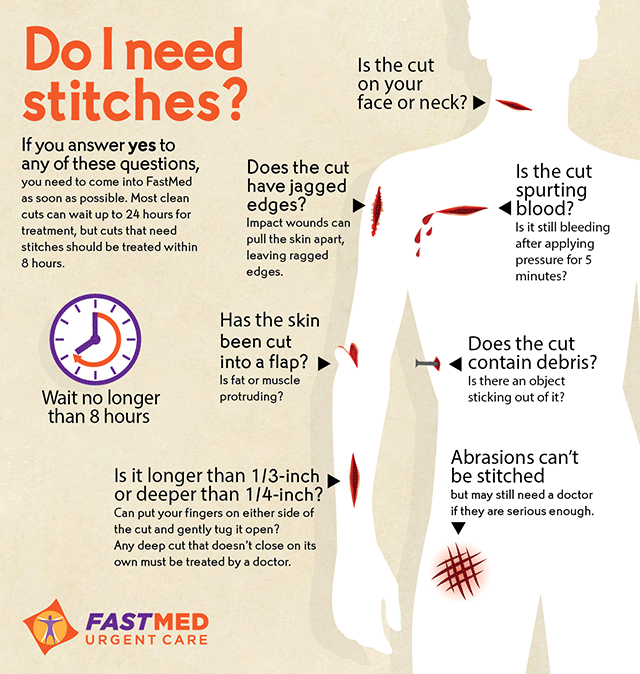 Check out the creative infographic below for helpful and illustrated descriptions of the types of wounds that might require stitches.